^ Gabe Newell - Forbes. Forbes. 2012-03 [2011-03-08]. ^ Victoria Murphy Barret,. It's A Mod, Mod Underworld. Forbes.com. 2005-12-12. ^ 3.0 3.1 CVG Staff. Creative Minds: Gabe Newell. computerandvideogames.com. 2007-09-28 [2008-01-05]. ^ Geoff Keighley. The Final Hours of Half-Life 2. GameSpot UK. [2008-01-05]. （原始內容存檔於2009-04-17）. ^ Mark Androvich. PS3 a "waste of time" says Valve's Newell. GamesIndustry.biz. [2008-02-22]. ^ Stuart Bishop. Valve: PS3 a "total disaster on so many levels". computerandvideogames.com. [2007-01-15]. ^ Portal 2 coming to PlayStation 3. ^ Mike Fahey. Valve Figured Microsoft Would Fix The Xbox Live Train Wreck. Kotaku. [2010-09-11]. ^ Valve boss Gabe Newell calls Windows 8 a 'catastrophe'. BBC News. BBC. 2012-07-26 [2013-03-07]. ^ Chiang, Oliver. 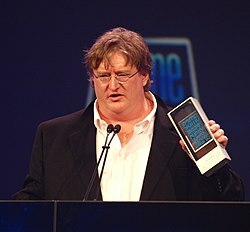 Names You Need to Know in 2011: Gabe Newell. Forbes. 2010-11-13 [2013-03-08]. ^ Valve's Gabe Newell Is The Newest Video Game Billionaire. Forbes. 2012-03-07 [2012-03-11]. ^ Sally Macdonald. TUNED TO THE DUNES. Seattle Times. [2008-01-05]. （原始內容存檔於2010-04-03）. ^ The Master of Online Mayhem. Forbes. 2011-02-09 [2011-02-13]. The founder of videogame seller Valve suffers from Fuchs Dystrophy, a congenital disease that slowly destroys the cornea. "I have dead-people eyes", he said at the time. Double cornea transplants in 2006 and 2007 cured him and changed him utterly. ^ Gabe Newell: My 3 favourite games. Computer and Video Games. 2011-04-04 [2011-04-08]. ^ 玩家出了口惡氣：G胖官方承認他不會數3. 網易. 愛活網. 2018-08-23 [2019-02-23] （中文（簡體）‎）.